INTP children are known for their ingenuity, imagination, and their endless need to make sense of the world around them. They are a rare breed, making up only 3% of the US population. As such it is rare for them to find other individuals who understand them or process things the same way they do. While all children go through a “why” phase, the INTPs entire life seems to revolve around “why”. Why are we here? Why do people believe in God? Why don’t people believe in God? Why do we have to go to school? Why can’t we learn on our own? More than anything, INTPs want to understand the nature and logic of everything around them. This desire for knowledge is fueled by an intuition that leads them down numerous theoretical pathways that are unique and often uncharted. 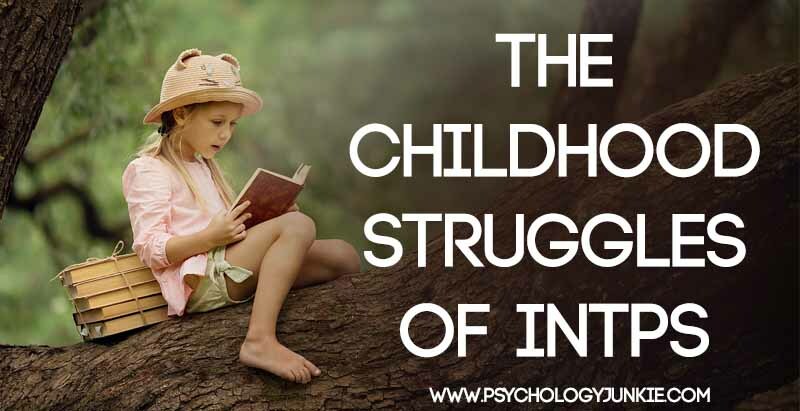 But what unique struggles do INTP children face in the world? That’s what this post aims to address. INTPs are insatiably curious and rarely accept anything at face value. If someone gives them a rule they have to know why the rule exists and whether or not that rule is grounded in logic. They tend to be skeptical of rules and anything that seems to be based on tradition rather than logic. If a parent or teacher tells them to do something “because I said so”, or because “that’s just the way it’s done” they will certainly need to be prepared for further convincing and logical appeals. The curiosity of young INTPs is often stifled by parents who get tired of answering questions or who merely have no interest in figuring out answers. I’ve heard from many INTPs who were restricted from asking questions and were told more or less that “children are to be seen and not heard”. This can create a lot of anxiety and stress for young INTPs as they essentially have to suppress a major part of who they are as people. You can read more about this in Is Arguing Your Child’s Learning Style? INTPs have a strong internal set of standards that they strive to reach. They care about being logical, being fair, and pursuing their independent interests. They care far less about what a report card says or what teachers think about their performance. For this reason they may seem like chronic underachievers. Parents can often tell that they’re smart, but they don’t see it always translating into good grades. INTPs hate repetition and routine and unfortunately for them, much of the elementary school years revolve around those two things. Reciting off times tables and memorizing lists of facts are hardly interesting to them so many young INTPs let their minds wander to other more fascinating subjects. Teachers who think outside the box and keep classes challenging can pique the curiosity of the INTP child, which is extremely motivating to them. They are drawn to new and novel ideas and mental challenges so they are quite capable of doing well if they are properly motivated. If unmotivated, however, they won’t particularly care about proving their aptitude to anyone besides themselves. It isn’t until they take standardized tests that people are quite able to see how intelligent they tend to be. They routinely perform extremely well on the SATs and also have the second highest IQ of any of the types according to the MBTI® Manual. Young INTPs tend to struggle with navigating the emotional world of their friends and family members. They prefer the world of logic over the world of feelings and struggle to understand the emotional needs and sensitivities of others. They may be unintentionally cold and direct in their assessments and then be confused or embarrassed when they realize they have hurt someone’s feelings or made them uncomfortable. INTPs do care about their relationships as much as the next person, but because they have inferior Extraverted Feeling (Fe) they aren’t quite sure how to put their feelings into words and they struggle with reading emotional cues. This can be a source of insecurity and confusion for them as they grow up and many of them decide to keep their feelings under wraps. This can frustrate more emotional, feeling-driven parents who see the lack of emotional expression as a “cold shoulder”. They may push their child to be more affectionate, more verbally demonstrative or expressive. This can create a lot of stress for the young INTP who feels out of their depth when pushed in this manner. Many young INTPs would rather receive a letter acknowledging a parents love than have to respond right away to verbal demonstrations. They can feel “put on the spot” when emotional displays are made, but when they receive a letter they can consider their own responses and enjoy their emotions privately without worry. Young INTPs crave independence and autonomy and will feel trapped in a controlling environment. They often love to get out on their bikes and explore the far reaches of their town. They enjoy being alone and reading books, listening to music, drawing, creating, taking things apart and putting them back together. Helicopter parents or parents with strict household guidelines and structures can be a great source of stress to them. If they’re not given adequate alone time or freedom or chances to prove their competence they can get depressed and overwhelmed. It’s important that they be given alone time each day to pursue their own independent interests and that they be given responsibilities and opportunities to prove their maturity and capability at taking care of themselves. While smothering, controlling parents are difficult for young INTPs to deal with, parents who simply don’t take the time to notice them are also a source of pain. INTPs are usually reluctant to express their fears, insecurities, and worries, but this doesn’t mean they don’t have them. 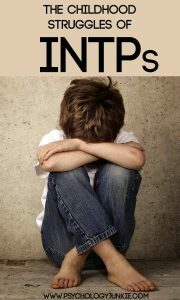 Many parents see the quiet, reserved nature of the INTP and just assume that if there’s a problem they will speak up. They get busy with their own lives and the child starts to fade into the background. If the child has more outspoken siblings they make take the limelight on such a regular basis that the young INTP feels invisible. It’s extremely important for parents to pay attention to their children, each of them. They can promote a better relationship with their child by making themselves available; many INTPs enjoy going on car rides, listening to music, or just being able to work alongside their parents in a non-pressurized way. When they do decide to talk it’s important for parents to listen intently and patiently and not jump in with a lot of advice and chatter right away. If parents can prove that they’re available for them, understanding of them, and accepting of them, young INTPs will feel much more able to share their concerns and ask for advice. Young INTPs have an enormous amount of potential and ability. They are often intelligent, innovative, and curious. Having a good childhood will give them a strong foundation in being able to explore their many ideas and interests. I hope this article has been helpful! Please share any thoughts you might have in the comments! Reading this makes me love my parents ever more, for pretty much nailing my upbringing as an INTP most of the time. I’m going to make sure to say that to my mom. This is especially true for me. My parents saw a good normal child who performed well in school, whose only concern was to get more books to read, songs to listen, crayons to draw with, and left me mostly to my own devices. They only pay attention to my grades, or when I am fed up enough to lash out against them. In hindsight, I must’ve learned everything I need from the encyclopedia and not from my own father and mother. They did give me freedom to explore, but sometimes I wish for them to explain what I couldn’t understand from books alone. Sometimes I wish they’d have read my books with me. This is such an accurate depiction of what my childhood was like, and I’m so grateful I had parents that took the time to understand my needs. I would like the source for this, since most of the studies I’v read put INTP and INTJ first not third, and it also depends on the sample group used. Some studies put INTP first others INTP, but mostly it was INTP from what I’ve gathered. Some extra source to balance out my views would be nice. Thanks in advance. Sure! The source I’m using is the MBTI® Manual – Third Edition. Page 269 has a comparison of types and IQ scores as well as grades. You actually have found an error, though! Looking at the manual now I see that I misread the graph. INTPs have the third-highest grades in High-School and the second-highest IQ score. I must have mistakenly looked at the graph for grades instead of IQ when I wrote this. So I will fix that now! This is so me it’s not even funny! I could go on and on. In fact, i was going on and on; literally writing in detail my life story, before I realized I was going on and on. So INTP. LOL. Suffice it to say, I was raised and have been exposed to a variety of “unique” (aka narcissistic & borderline, bipolar, anxious, etc.) types in my day and I’ve had this unquenchable curiosity to try to explain why. Even after already thinking i’ve “figured it out”. I’m always searching for the meaning in things, the relationship between things, the cause and effect, action/reaction, yin/yang. I scour the web researching my ideas to supplement my own theories based on logic and sound, unbiased and vigilant observation. I am always trying to explain my upbringing and really just why people and society act they way they do. Maybe not all that different than Jung.